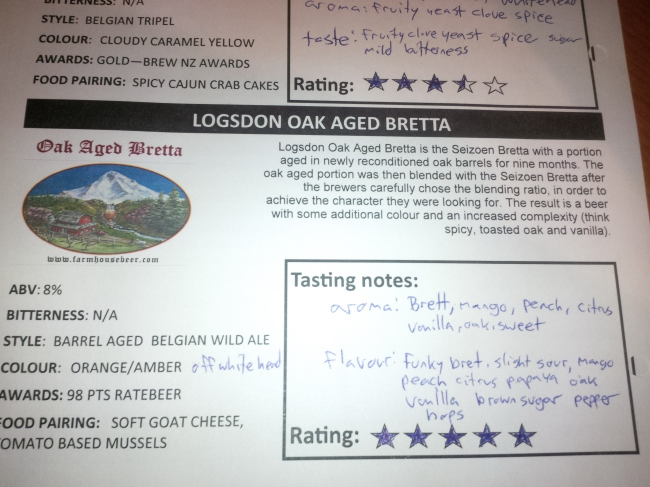 From Hood River Oregon’s Logsdon Farmhouse Ales comes their “Oak Aged Bretta” a Saison (seizoen) with the wild Brettanomyces yeast added and a portion aged in Oak Barrels to develop flavours . This is an oak aged version of the Seizoen Bretta. The beer pours a very cloudy orange colour with an off white head. The aroma consists of a funky Brett with lots of fruit including mango, peach, citrus as well as some sweet vanilla and oak. The flavour is of Brett, funk, slight sour, fruits including mango, peach, citrus and maybe some papaya with oak, vanilla and some brown sugar, pepper and hops bitterness. The alcohol content comes in at a strong 8%. The Seizoen Bretta is one of my all time favorite beer so when I heard there was an oak aged version I jumped at the chance to pick up a bottle. This beer did not disappoint! 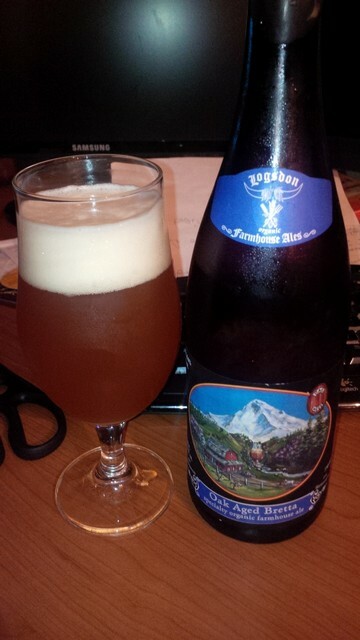 This beer is by far one of the nicest beer I have ever drank. COMMERCIAL DESCRIPTION: Our organic Oak Aged Brett is made with our Seizoen Bretta that is aged for a period of time to develop the wood aged character in the beer. Oak Tannins, vanilla notes and subtle smoky spiciness soften and mellow this beer over time. The aged unfiltered beer is refermented and carbonated in the bottle with select yeast strains to provide added dryness and complexity. This entry was posted in Barrel Aged, Saison, Sour Beer and tagged barrel, barrel aged, bitter, bitterness, brett, brettanomyces, brown sugar, citrus, fruit, fruity, funk, hood river, hops, hopy, logsdon, logsdon farmhouse ales, mango, oak, oak aged, oregon, papaya, peach, pepper, saison, seizoen, seizoen bretta, sour, vanilla. I haven’t tried this version of their seizoen yet, but I’m excited to try it. So good and only $13 or so in BC. Almost $10 cheaper in BC from what I hear.